SimMan Vascular is the first start-to-end medical simulator for stroke, heart attack and acute trauma designed to cover the entire patient pathway. For some patients, time is the most critical factor. Not only for survival but also for bed days, recovery and long-term health. Use SimMan Vascular to follow a simulator from an incident at home, in the ambulance, to the emergency room, and to the cath-lab to help improve both protocols and patient’s outcome. 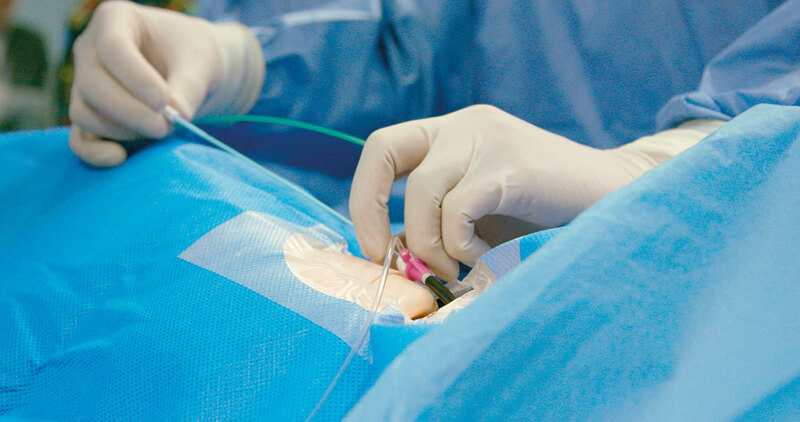 Studies conducted in cooperation with Laerdal Medical have shown that a 15-minute reduction in “door to needle” time can reduce convalescence up to one month. As it turns out, hospitals that focus on quality improvement also improve patient outcomes as well as business results. SimMan Vascular is created to let clinicians diagnose and treat the patient simulator through the entire pathway while using the same equipment and techniques they use in their daily work. Inside the cath-lab, clinicians can use endovascular tools, including catheters and guidewires. Separate controllers for balloon inflation and contrast material injection are also provided. Completely wireless, self-contained, rugged and reliable, SimMan Vascular delivers immersive in-situ training when and where it is needed. And, you control everything with LLEAP - Laerdal’s simulation software. Follow SimMan Vascular as training moves from a pre-hospital to in-hospital recovery environment. Optimize the patient pathway and perform continuous improvements for critical care patients. Conduct quality improvements for a range of specialties with only one manikin. Utilize real-time scenarios targeting every team, from EMS to nursing, medicine, and surgery. SimMan Vascular allows hospitals to improve processes and update protocols. This way, they make progress for patient recovery as well as hospital economy. Implement best-practice in your cath-lab, and use the actual tools and equipment you would in a real-life situation. This is safe learning for students and experienced professionals. It also creates safer surgical procedures for future patients. Practice on critical procedures such as passing and rotating wires as well as injecting contrast media. SimMan Vascular allows for teams to train on quicker and safer procedures. A quicker procedure means less use of x-ray and contrast media. SimMan Vascular is made in cooperation with Mentice, the world leader in virtual reality‐based interventional medical simulation solutions. Their VIST software has been integrated to work within Laerdal’s LLEAP simulation software. Add realism by combining real endovascular tools with simulated images on the monitor. Using advanced 3D video imagery, the Mentice software mimics what learners would see on real fluoroscopy screen. Do it right. Then do it on a real patient. Research shows that simulation is 4 – 16 times less expensive than training on animals. SimMan Vascular is equipped with everything you need to plan, run and debrief simulation training - from the patient simulator to fluoroscopy monitor and a LLEAP license. 3 scenarios are included, with several more purchasable per category; stroke, cardiac arrest, and trauma. Laerdal Medical cooperates with Mentice to provide the high-fidelity simulation experience behind SimMan Vascular. Mentice is the global leader of simulation-based performance solutions for endovascular therapies. SimMan Vascular is built on the trusted SimMan 3G platform with built-in Mentice VIST endovascular technology to extend the immersive training course potential to the Endovascular Specialists, Cath Lab team, and Pre-Hospital care providers.